Muscle imbalance is commonly the cause in children and adolescents. May be related to inflexibility secondary to growth spurt, patellar hypermobility, improper training, change in footwear. (Smith AD, ICL 2003;52:691). Risk Factors: shortened quadriceps muscle, abnormal VMO response time, decreased explosive strength, hypermobile patella. (Witvrouw E, AJSM 2000;28:480). Articular cartilage of the patella is up to 5mm thick; the thickest in the body. Generally complain of pain with stair climbing or prolonged sitting. Quad tightness-flex knees as far as possible with pt prone, pelvis stable. Normal-symmetric flexion c heals at or near buttocks. Patellar tilt testing demonstrates decreased lateral patellar elevation. Q-Angle: angle formed by the intersection of a line drawn from the ASIS and the patella and one from the tibial tubercle to the patella. Normal <10° in men, <15° in females. Patellar Apprehension: patella is pushed lateral with the knee in 20-30° of flexion. A feeling of impending dislocation (apprehension) is a positive test (indicates patellar instability). 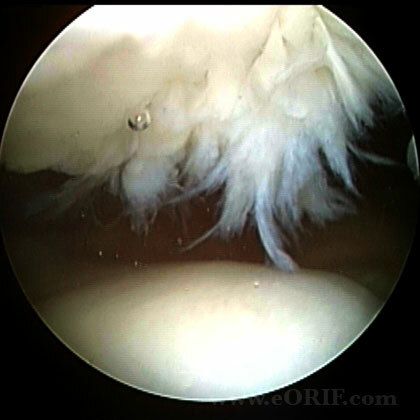 Pain reproduced with compression of the patella while flexing and extending the knee. J-sign: lateral deviation of the patella in terminal extension = patellar instability. Assess andkle and subtalar aligment. Foot pronation can affect patellar alignment. Weight-Bearing A/P, and Lateral; eval for bipartate patella. Trochlear dysplasia indicated when the depth of the trochlea intersects the anterior cortex on the lateral view. CT axial images demonstrate lateral patellar tilt. Images should be taken at 15°, 30°, and 45°. Patella is significantly tilted if the patellar tilt angle (angle created by lines drawn along the lateral facet of the patella and the posterior femoral condyles) is less the 12° on the 15° flexed images. Patellofemoral brace / McConnell taping, PT with extensor mechanism and hamstring stretching and strengthening, NSAIDs, terminal knee extensions from 20° to full extension. (Witvrouw E, AJSM 2000;28:687).